This section provides step-by-step instructions for creating, configuring, and testing a static one-way send port using the CData BizTalk Adapter. You can use static one-way send ports to execute updategrams, SQL commands, and stored procedures. Send ports are useful for operations that modify Salesforce data but do not have any response data. Typically, this would be DELETE or UPDATE SQL commands or updategrams, and occasionally stored procedure operations. If you want to trigger actions that will return a response, such as executing SELECT commands or retrieving the Id of a record that you have created, use a solicit-response send port. Create a static one-way send port and configure it to use the Salesforce adapter as its transport type. In the node for your BizTalk application, right-click Send Ports and select New -> Static One-Way Send Port. 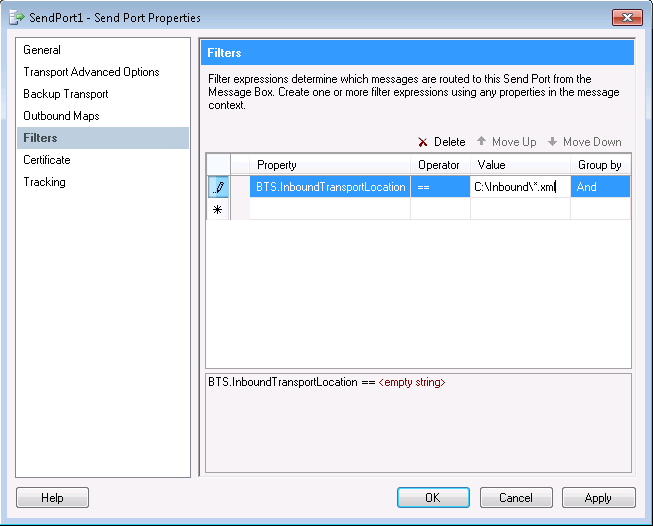 The send port properties dialog is displayed. In the Name menu, enter a name for the send port. In the Type menu, select CData.Salesforce. Define the command that the adapter will execute in the Transport Properties dialog. In the send port properties, click the Configure button. The CData.Salesforce Transport Properties dialog is displayed. 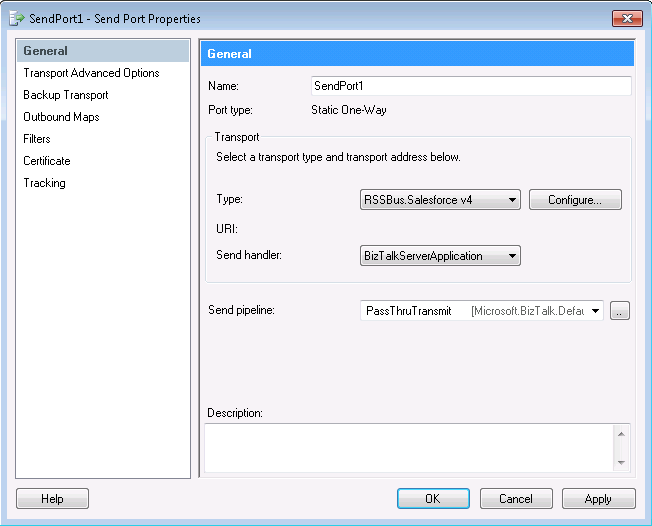 In the send port properties dialog, click Configure. The adapter properties dialog is displayed. Click the button in the Connection String property. Click the box in the Connection String property. The Connection String Options dialog is displayed. Enter connection properties. Required properties are User, Password, and Access Token. Refer to the "Connection String Options" chapter in the help documentation for a description of the various properties and their functions. After you connect successfully and define the command the adapter will execute, the send port is ready for use. See the following section for an example of using a one-way send port in a simple application. The application reads updategram commands contained in a file and uses a send port to execute the command. In the example, filters are used to move the messages that contain the updategram from the receive location to the send port. See the following section for more information on filters. To associate a send port with the messages you want, create a filter rule in the Filters section of the properties for that send port. Messages matching the criteria will be routed to the send port. See the following example to filter on a receive location. A one-way receive location picks up the XML document containing the updategram. 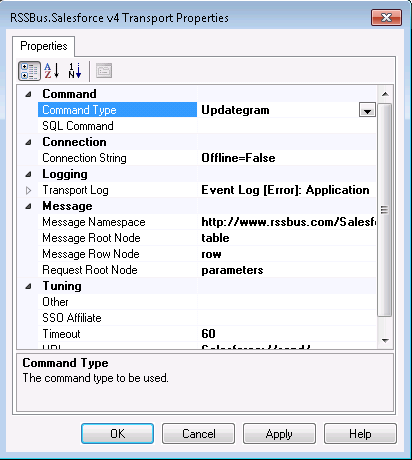 The receive location creates a BizTalk message containing the results of the command. A one-way send port filters on the URI of the receive location. The document is routed to the one-way send port. The send port executes the updategram command. Create and configure a static one-way receive location. Use the File transport type. You can follow the same procedure to create and configure a receive location for the CData BizTalk Adapter for Salesforce. Create a static one-way send port. In the send port properties, click Filters. Select BTS.InboundTransportLocation from the menu. Enter the URI of the newly created one-way receive location.